Welcome to fall y'all! Today marks the first day of a wonderful season. We don't see many signs of autumn around our parts, but we sure do enjoy the little taste that we get. I am a lover of pumpkins, corduroys, burlap, football, pies, oh the list could keep going and going! Despite it being in the high 80s in North Florida, we are happy to welcome this time of year with a kid friendly craft. You might have seen this paper bag oak tree in the past, but it is worthy of sharing again and again. I've used it for years in my class to create family trees, but this year my son and I used it to learn about colors and practice his fine motor skills. All you need is a brown grocery sack, and anything you would like to add to it. To construct the tree you will open the grocery sack and turn in upside down. Using scissors cut one inch strips around the bag from the opening to the first fold in the bag. At this point it will look more like a jelly fish than a tree. Just below that fold you are going to squeeze the bag by pushing in from the left and right. Once you have a good handful, start twisting. I used a wired ribbon to keep mine well twisted, but you don't have to. Give the bottom of the sack a good whack to flatten it out. Then you will simply twist each of the strips to create branches. Younger children will need help with the construction, but by third grade they should be able to handle it on their own. 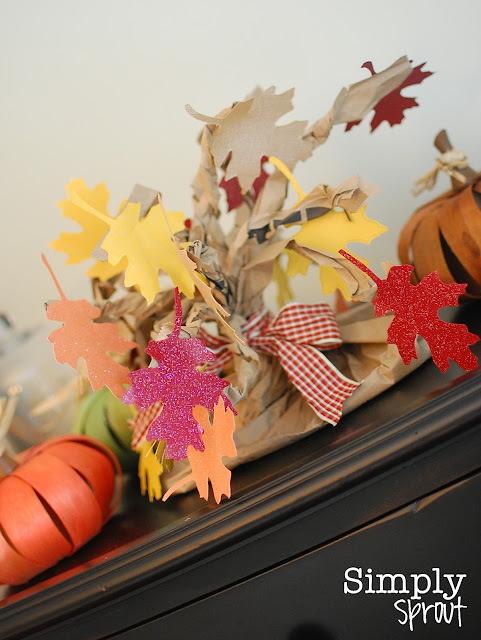 We used glitter scrapbook paper to create fall foliage. The pumpkins are from the dollar section of Target (although they were $2.50 each...tricky, tricky), and add some more fall fun to our scene. * Encourage children to write a story about their "magical" fall tree. * As mentioned above, research your family and create a family tree. Each leaf is dedicated to one family member. 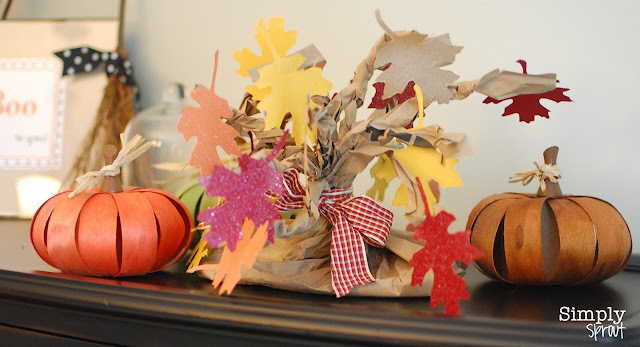 * Have children write things that they are thankful for on leaves over the next month and leave out as November and Thanksgiving centerpieces. * Have students make a tree for a classmate. The student is responsible for rounding up adjectives from other classmates that describe the person. Then they are able to present a classmate with a tree full of positive remarks. * Create multiple trees to represent trees of all seasons. Or simply do a drawing of the trees during different seasons. Most of all enjoy the first day and the many days to come to the fall season!